The socks are done, I finished them about 10 minutes ago! Overall I love the mis-matched socks even though I'm a matchy matchy girl deep down inside. The pattern is one that is in my head that is old and memorized and fits my feet exactly. 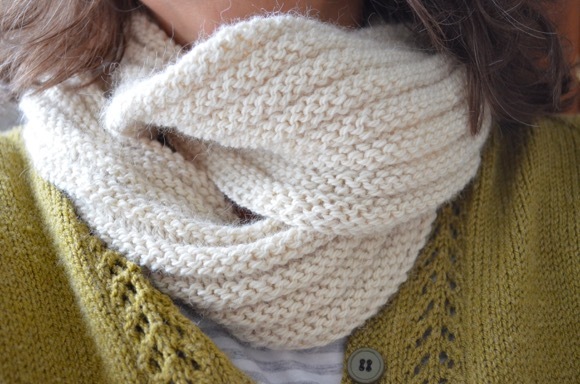 I love to knit the same patterns over and over again. 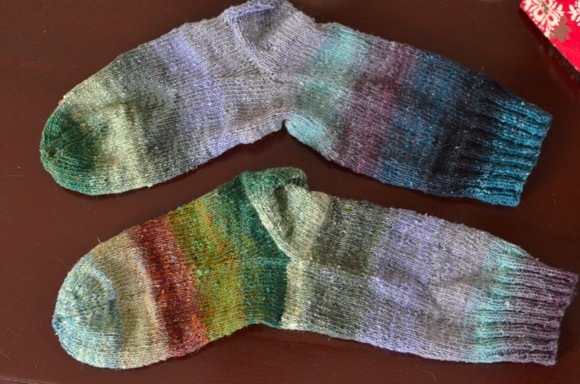 The Noro sock yarn (taiyo sock yarn) is a lovely long repeat colorway. Half of the yarn is cotton and that is hard on my hands, I tend to shy away from cottons because of this. The yarn is tightly spun so while I was knitting it would easily twist up and tangle. On the second sock I was finishing the short rows and heading to the gusset pick up when to my surprise there was a knot made with green yarn added to the lavender yarn! (the company did not match up the wool colors). I was lucky to pull a bit out and continue with the sock with enough of the remaining skein. Phew! They turned out lovely. They are matchy-matchy in a way ----- the yarn type makes them look plenty matchy. I think they look lovely and interesting due to their non-matchiness! Very nice. I once made a pair out of Silk Garden and they actually matched ! This was a shocker because Moro socks never match. I luv yours. Nice spring colors. Oh, I love them! Noro yarn is always so satisfying to work with. Fun! Isn't it annoying when you happen upon a knot? Glad you had enough yarn to finish. Your socks are so pretty, Karen. I like the colorwave in them and that they are each different. They really turned out so pretty. Glad the knot wasn't a real problem for you - so disappointing when that happens. Nice finish. Cotton socks on my feet , I don't like. 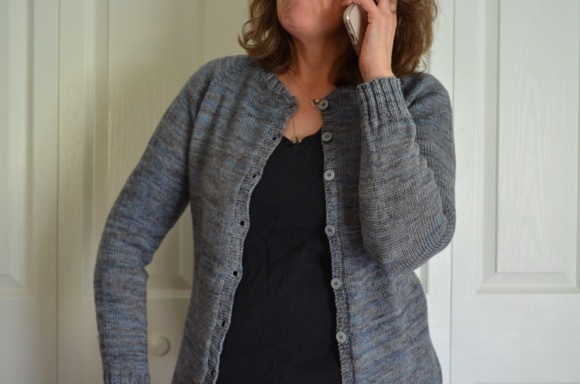 But I admire you for knitting with the Noro and Sticking it out and not wasting the yarn. I don't really like Noro. 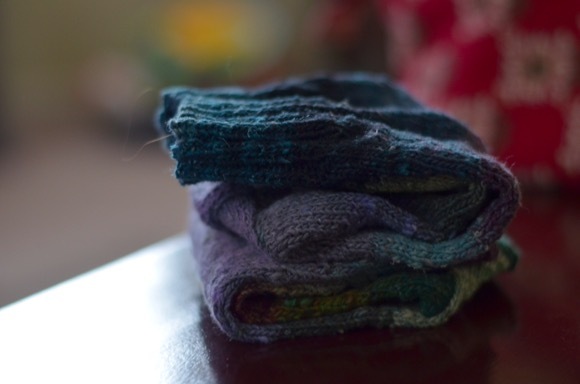 I did knit one shawl in a soft Noro that had some ? alpaca in it and it is very soft. But as a rule, Noro and I don't do well together. ! These look very cozy. I really like the colors in the yarn. I haven't knitted with Noro yet. Glad you were able to work around the knot issue. Having a knot in your yarn is so annoying! Your socks are anything but annoying. They're gorgeous! Love their unmatchy matchyness. hands also. I feel like I'm "pushing dirt" on the rare occasion when I use it. Oh those darn knots. Your socks are very nice. I like their fraternal look. 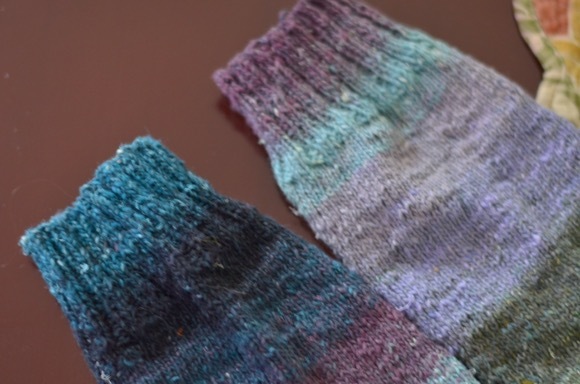 Will you wear them in warmer weather since there is some cotton in the yarn? I'm not a huge fan of knitting with cotton either - except the occasional wash cloth. I think they look great. I’m glad you were able to fix the knot issue. Keep your fingers crossed for me as I work the heel of my sock. They look great! I'm trying to knit with cotton because of the hot weather here, but I'm not really happy with it. I'm even starting to think this is the reason I've lost my knitting mojo.